Die Britischen Inseln, von Wilhelm den Eroberer bis zum Regierungs-Antritte des Hauses Tudor, 1066 bis 1485. 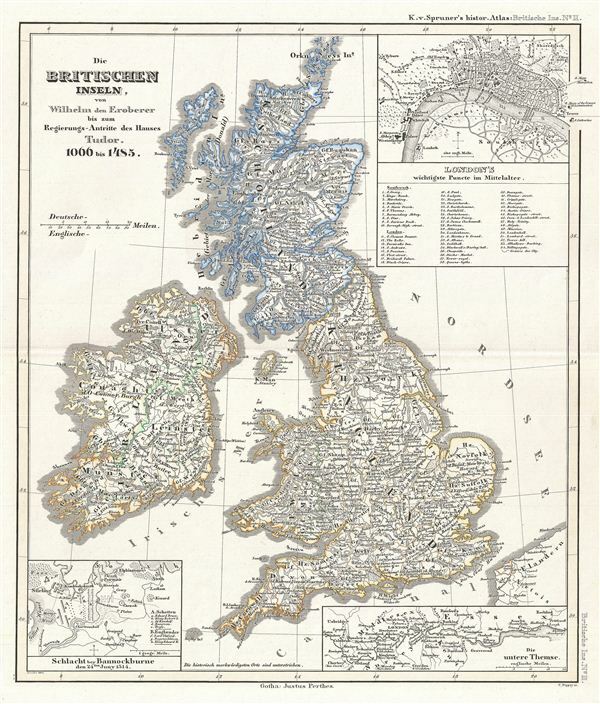 This is Karl von Spruner's 1854 historical map of the British Isles from the time of William the Conqueror to the rise House of Tudor, or 1066 to 1465. The map covers from the Orkney Islands to Cornwall, including Ireland. Three inset maps, on the top right, bottom right and bottom left corners detail London in the Middle Ages, the lower Thames, and the June 24th, 1314 Battle of Bannockburn. In 1485, during the final battle of the War of the Roses, Henry Tudor defeated Richard III and married elizabeth of York, becoming the first english monarch of the Tudor Dynasty. The map also identifies the battle of Bannockburn, where, for all intents and purposes, Scottish Independence was established in 1314. The whole is rendered in finely engraved detail exhibiting throughout the fine craftsmanship of the Perthes firm. Prepared by Karl Spruner for publication as plate B II in the second edition of Justus Perthes' 1854 Historich-Geographischer, Hand-Atlas zur Geschichte der Staaten europa's vom Anfang des Mittelalters bis auf die Neueste Zeit.